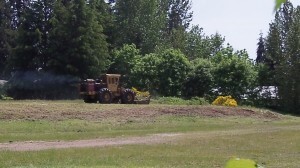 Vegetation was being cleared on the site Wednesday. The riverfront is my beat, and Wednesday I noticed activity on the former Permawood property on the east side of Geary Street across from Bowman Park. So, are the owners of that parcel going ahead with their long-standing plans for an apartment complex? Not yet, apparently. The view from the riverside trail between Bowman and Simpson parks. The Albany Community Development Department says it has no application on file for a site plan review, which would have to be approved before construction could start. The owners also have yet to get a public works permit for site preparations such as grading. The work Wednesday looked mostly like mowing or removing vegetation from a portion of the site. A worker from a Salem company was using a machine called a Hydro-Ax. A neighbor was concerned about dust and dirt flying about, and when a police officer talked to the equipment operator, the work stopped, according to Anne Catlin in the planning department. 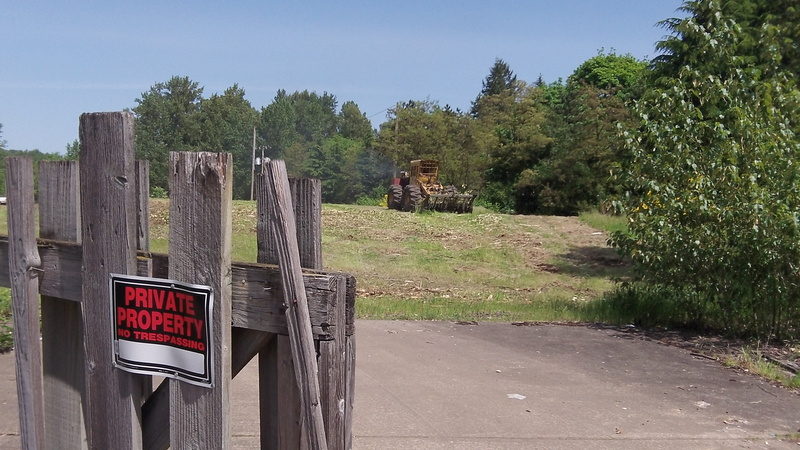 Last summer the owners, from Salem, had a neighborhood meeting about their plans to build apartments on the six-acre former Permawood industrial site, which was rezoned years ago for medium-density residential development. Last year there was talk of 120 units in three four-story buildings. But Catlin says a flood-plain-development permit for the site mentions 90 apartments.